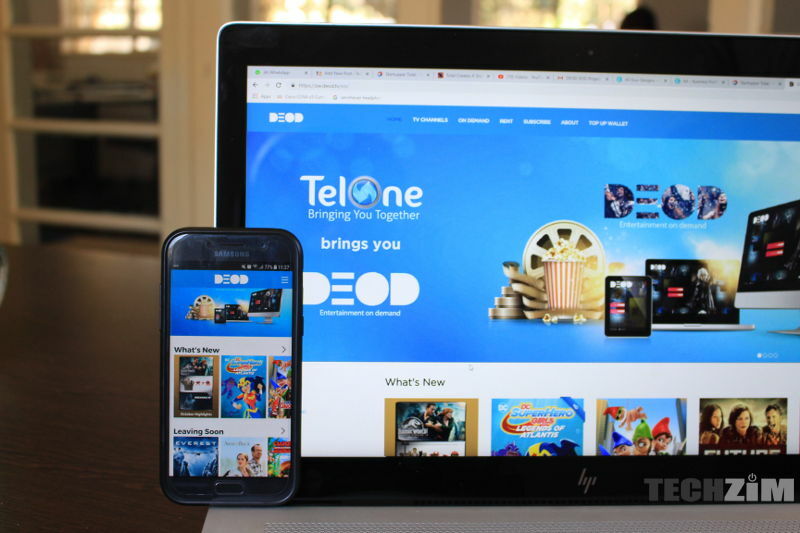 So TelOne launched their DEOD streaming service last week and one of the best things about that announcement was that TelOne subscribers get to stream DEOD content for free. The zero-rating of these services is great because it gives people a chance to sample the product before they actually commit. As it turns out the zero-rating isn’t unlimited. Subscribers will, in fact, get 100 Gb every month to stream on DEOD. A colleague stumbled upon this when he got a notification from the self-service portal notifying him of his current data balance. When he was informed of the other 100Gb, of course, he asked and they informed him the other data was for DEOD. For those of you who want to bring out their pitchforks and demand unlimited data, I would ask to you stop in your footsteps. You most probably won’t finish that data because TelOne DEOD doesn’t allow you to stream most of the on-demand content in HD. Yes, if you accessing rentals you can watch those in HD but I still think it will take an ungodly amount of watching for you to actually exhaust that data. It’s also logical that they would cap the bandwidth as they would also want to ensure that speeds are optimal. Giving everyone unlimited data for streaming purposes could lead to some problems if the service is well received and consumers sign up in droves. BIG DEAL? I don’t think there is a problem but then again I rarely binge watch tv shows so maybe I’m looking at this all wrong… Is 100Gb too little or is it just about enough for your needs? A SD movie is normally somewhere around 800MB-1GB, and lasts just over an hour. So rounding off to 1GB per hour, 2 movies a night during the week and 6 hours a day over the weekend you get 94.6GB over a month (4.3 weeks in a month). Sounds OK, unless you like to watch the news in the morning before you go to work. Or the kids like to watch cartoons after school. Of the new season of Game of Thrones starts and you have to bing-watch the entire 6 seasons to remind yourself who everyone is. So 100GB is probably about right for a working individual who that into tv. If they aren’t into TV, they won’t be paying for a service like this, so it seems rather stingy of TelOne, especially as it’s all local traffic so doesn’t cost them anything. the problem with this service is that the network is poor to the extent that there is too much buffering and the quality of the content sometimes becomes poor whilst watching, probably 144p and adjusting the settings does not change anything. because of these challenges, as long as the network does not improve(probably where i am staying) i do not see any motive for me to subscribe to the service. the service however in itself if the internet speeds were adequate for streaming, it is a very appealing package. the 100gig is fair, but i am not worried about that, my worry is Telone’s buffer bloat. for streaming an HD movie you need at least 10Mbps true connection but the DEOD is somehow throttled!